Discover the best of Australian Summer! Australia is known for being the place to be during its’ summer season. There’s an endless amount of things to do here! Check out our top 10 favourite activities and adventures around Australia. This is an obvious one, but sometimes we need to be reminded that the Great Barrier Reef is right under our noses! Unfortunately, the Great Barrier Reef is quickly dying, so take advantage its beauty soon. The largest sand island in the world stretches over 120km. It’s filled with a vast array of activities ranging from four wheeling, snorkelling, to relaxing on the beach. Can we just say “wow”! The Great Ocean Road tends to be cold throughout the year due to the fact that it’s on the coast and can be pretty windy. So we suggest making your way down there during the summer when you have the best chance of some warmth. Whether you do a tour, or rent your own car, it’s definitely worth it and an experience of a lifetime! The famous Ayers Rock, is a massive sandstone monolith in the heart of the Northern Territory. Uluru is sacred to indigenous Australians and is thought to have started forming around 550 million years ago. One of the most famous beaches in the world where several movies have been filmed. You can even make your way down the Coastal Walk to Coogee Beach. Whitsundays is made up of 74 gorgeous Islands. That means 74 reasons to go, right? Australia Zoo is about a 40 minute drive from Brisbane’s CBD. Australia Zoo is Steve Irwin’s Zoo. You can have the experience of a lifetime as well as honour Steve Irwin’s legacy. We all know the Gold Coast, but the Sunshine Coast is Queensland’s treasure. With a fraction of the amount of tourists that the Gold Coast has, the Sunshine Coast has incredible beaches like Noosa where you can enjoy swims in the Fairy Pools. Blue Mountains are amazing all year round. If you make your way to Sydney, take a 2 hour train ride (2 hours on the dot) to the Blue Mountains and relish in the views. Warner Bros. Movie world is the only movie related park in Australia and is located in the Gold Coast. Here you can watch shows, interact with characters, and ride some awesome rides! 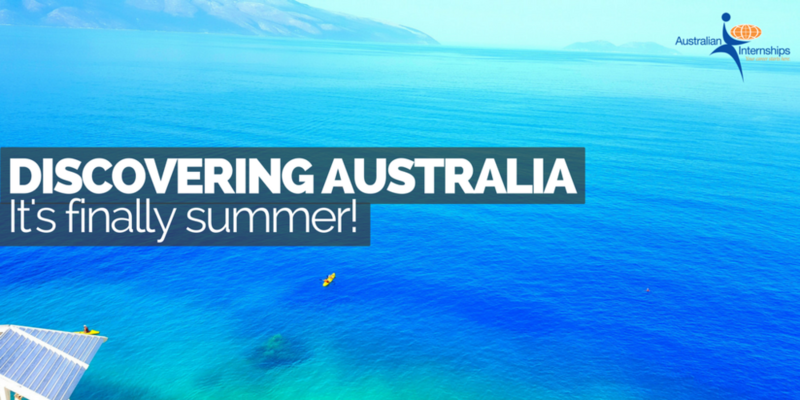 Go, have an amazing Australian Summer and be sure to send us pictures from your adventures! Published on December 14, 2017 by Daniele L.